Boston University, where I am the Catholic Chaplain, is only a block away from Fenway Park. On October 31st, a million or so people in Boston lined the streets to participate in the Red Sox World Series Win Parade. As the Sox rode down the street, tens of thousands of others joined in, celebrating the Sox win. Some who went to the parade probably never watched a Sox game, but they wanted to be part of the event. Some may have bought a Sox hat and felt that that entitled them to say, "WE won!" Others, avidly watched every game throughout the long series. We like to celebrate when "our team" wins. We like being a part of it. Even though we had very little to do with it, we somehow feel like when they win, we win. 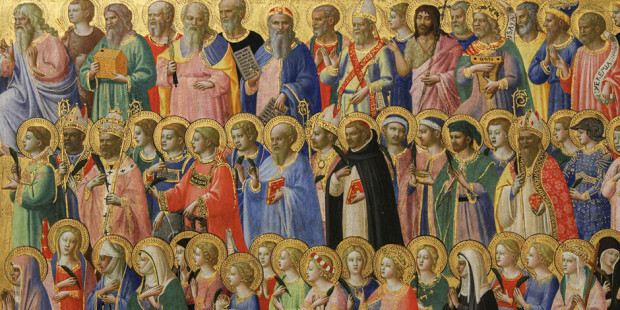 Today, we celebrate the Solemnity of All Saints. We celebrate the Win of our brothers and sisters who have fought the good fight and won the victory. The Sox didn't win the world series by lottery. They won by practicing and excelling. The Saints were not spectators in this life. They had a desire not just to watch others be holy. They desired personal holiness. They got in the game. By God's grace, they strove for excellence. They strove to win. They, as that old black spiritual says, wanted "to be in that number when the Saints go marching in." They did what it took and fought the good fight. The way to the World Series is a long slog. The way to heaven is a lifelong pilgrimage. The Sox won the Word Series. I can say, "We won," but nobody gave me the money or the trophy. Nobody asked me to be up on one of the trucks today. That's because I didn't actually play in the World Series. Sometimes, we think that we're going to heaven because that's just how it works. We bought a hat that, for instance, says, "Catholic" on it, so that's enough. But it's not enough. We actually have to want to be in that number when the saints go marching in. We have to be in the pilgrimage, not spectators of it. We have to be in it to win. I want to propose four very simple ways that are indispensable for Catholics who want to be in that number when the saints go marching in. 1. Go to Mass. If you are a Catholic and are not going to Mass every Sunday, there's very good reason to believe that your soul is in big trouble. Yeah, I know: Lots of people go to Mass on Sunday who are bad people. Okay, great. It does not, however, follow that we are now able to excuse ourselves from following the very basic commandment of worshiping God. 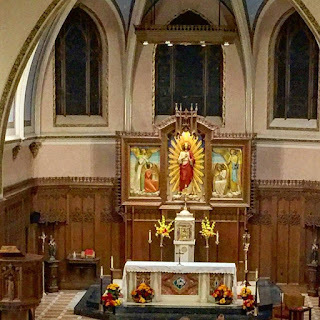 If you aren't going to Mass on Sunday (unless there is some grave reason), then you are putting yourself in serious spiritual danger. And the longer you don't go, the more difficult it will be for you to repent and to return. Shut the TV off on Sunday mornings, and go to Mass. The Saints worship God. They worshiped Him in this life, and they worship him forever in Heaven. Go TO MASS. Never miss. Ever. 2. Go to Confession. Confessing our sins is humbling. Staying in our sins is deadly. Baseball players need constant instruction in order to improve. We need constant mercy and grace to grow into heavenly champions. 3. Pray every day. Again, we can get so absorbed in everything else that we ignore the one most important thing: God. Talk shows, Twitter, sports, politics etc? None of these things are going to save us. If you don't know how to pray, ask someone to teach you. Learn how to read Scripture, how to pray the Rosary, how do mental prayer. 4. Grow daily in virtue and in the life of charity. Find virtues that are lacking in your life and try to grow in them. Are you negative about everything and complaining about everything all the time? Perhaps attempt to grow in gratitude. Is your humor negative or biting? Perhaps seek to grow in encouraging others. Are you stingy and selfish? Grow in generosity. We shouldn't presume that we are bound for heaven. There's nothing inevitable about it. We should be striving to live a holy life. A holy life demands everything from us. The way of the saints is the Way of the Cross. On All Saints Day, we honor those in our company who have won the race. Their example ought to inspire and encourage us to continue marching in this great pilgrimage. We are not called to be spectators. We are called to be in that number. We are either playing to win or we are wasting our time. Get in the game, so that you can be in that number. A Great Version of "When the Saints Go Marching In"
I have a love for words. Whether it is a clever joke, a poetic phrase, a beautiful song, a brilliant book, or a rousing speech, I enjoy words. Words contain incredible power. Recently, however, I've noticed that words are actually making me anxious. The words spoken about politics--mostly online--are vitriolic, demonizing, and divisive. Most of what I read fills with me with either disdain for the author or for his opponents. And then there are the words spoken about the Church. I cringe when I see articles about the Church these days, even (actually, especially) when they are written or spoken by people in the Church. Words--which ought to unite persons--are now the weapon of division. Yesterday, a young couple that I had prepared for marriage was wedded. As many couples do, they chose the second reading to be from St. Paul's First Letter to the Corinthians. "If I speak in the tongues of angels and of men, but have not love, I am a noisy gone or a clanging cymbal." Words. There are so many words being spoken and written these days, but they are all noise. It's like the more that is spoken or written, the worse things become. And then, there we were in that sanctuary. A man and a woman held each other's hands and spoke very few words to each other. "I take you to be my wife (husband). I promise to be true to you in good times and in bad, in sickness and in health. I will love you all the days of my life." That was it. Simple words. Pure words. They were not clashing cymbals and noisy gongs. They were noble and dignified. That's because they were spoken in love. And in those words, God united them. It was beautiful. I need to hear and to witness words like that. God was healing the world through this newly established union. We were reminded that this is how God made it to be in the beginning. The union of Holy Matrimony gives us a glimmer of the original plan and it also is a manifestation of that original plan of union for which we have all been created. After that wedding, I went to the home of some friends and offered Mass for them on the occasion of their 25th Wedding Anniversary. It so happened that the readings for the Mass this weekend were all about marriage. The first reading spoke about the creation of woman and the union between husband and wife. 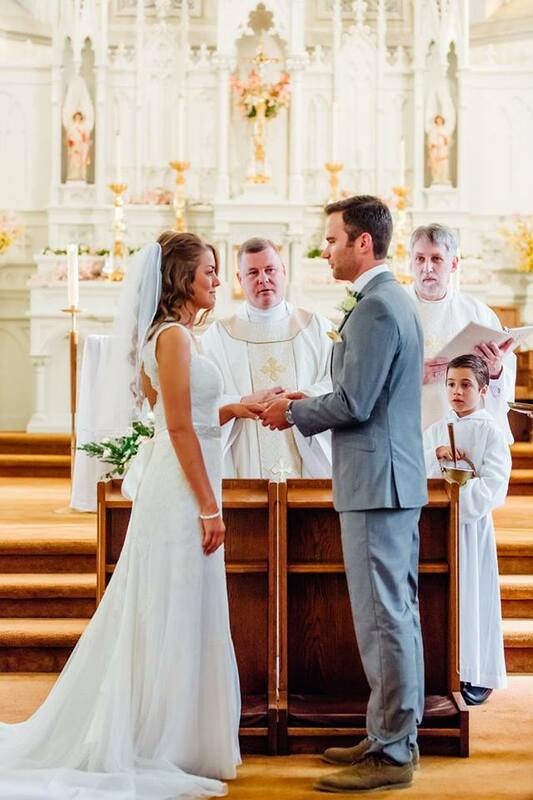 In the Gospel, Jesus spoke about the permanence of marriage; that it is an unbreakable bond. I told them that the homily for the Mass was really what was right before me: A man and a woman who spoke vows to one another 25 years ago and their beautiful children. The world needs to see families like that; men and women who give over their whole life to the raising of their children. More than ever, the world needs to see what true communion looks like. I need to see and to experience this type of communion. Everywhere we look, things are breaking apart. Words are tearing us apart. The people who are saving the world are those who can speak to one another in love and vow themselves to one another for life. Today--Sunday--I have to preach to university students about marriage. It's challenging because the culture in which they live has a very deformed view of marriage. Like everything else, it has become politicized and weaponized. It is also often about "self-fulfillment" rather than about laying down ones life for the other person and for the children of that union. So many couples delay marriage or don't ever get married because they are not willing to lay down their life. Jesus' words in the Gospel today can appear to many to be mean-spirited or antiquated, and they reject his words out of hand. I think the key to understanding the Gospel is the last part. Jesus says that we must become like little children in order to enter into the Kingdom of God. Yesterday, as I was leaving the wedding, I saw a man and a woman and their little daughter walking along. The daughter--maybe two or three--was walking carefully on the edge of the sidewalk curb as though she were on the edge of the Grand Canyon. Her face was filled with wonder and awe about everything she saw; buildings, leaves, trees etc. When we hear Jesus speak about marriage being between a man and a woman, that it is exclusive and permanent, or when we hear that marriage is intended to be for the pro-creation of children, it can sound like another political discussion. This is where we need the grace to be childlike. We need to stand in awe of the gift of marriage and have reverence for it. This union, established in the Garden of Eden, is how it was in the Beginning. God creates in order for us to experience communion, primarily with Him, but also with one another. Marriage is something beautiful, pure, and holy. Marriage is a gift from God. Marriage is about union. 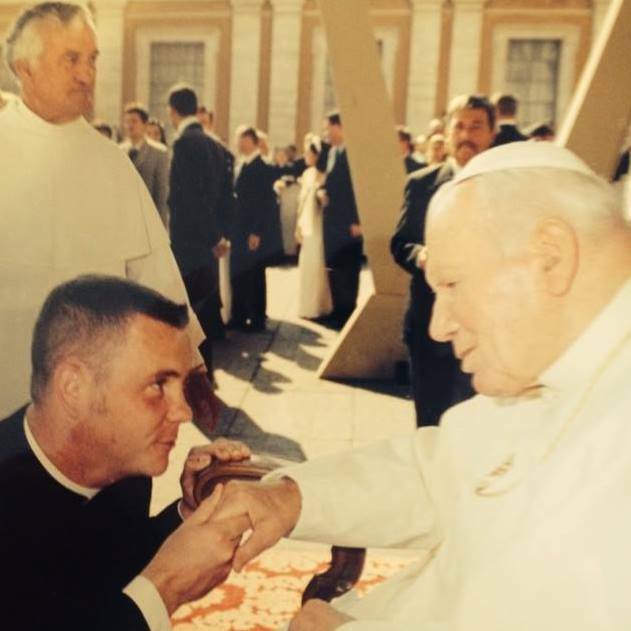 I've been a priest for almost 22 years. One of the great joys of priesthood is living my vocation close to those who are married. Today, in the midst of so much division, I think that marriage is the key to healing a world broken and devastated by division. Communion is attractive and pure. We need witnesses of communion. We need men and women to live marriage. Should I Donate to the Catholic Church? No and Yes. A few times over the past months, I've had someone tell me that they are no longer going to donate to "the Catholic Church." I don't donate to "the Catholic Church" either. In fact, I'm not sure who would be authorized to cash a check made out to "the Catholic Church." But I do donate to various parts of the Catholic Church. It is my responsibility to support the mission of the Catholic Church because its mission originates from Christ Himself who said, "Go therefore and make disciples of all the nations." Not only should I donate to support the mission of the Church, but it is a privilege to do so. During the month of October, the BU Catholic Center has its annual fundraiser. Recently, I sent out a letter to all of our families, friends, and alumni asking them to be generous in supporting us. Below, I will share that letter with you, but I want to add a few things as well. I've begun my sixth year at the BU Catholic Center. This past weekend, I've participated in my eleventh "CC Retreat." The title of the retreat that the student leaders chose was, "Homeward Bound." They wanted to communicate that the Catholic Center and the Catholic Church is a home away from home. The Church is our home--here and in heaven. It was spectacular! Students living their faith together and sharing such great friendships together. I received many messages from former students saying how they are praying for the current students on retreat. There's an incredible bond that exists among the "CC" family. The alumni know that the people on the retreat are going to have a life transforming experience just like they themselves did. Those who know me know that I like to throw right over the plate. So, if you're saying, "I'm not giving to the Catholic Church," that's bogus. If you're a Catholic, you have an obligation to support the mission of the Church. The Gospel matters. During the first weekend of school this year, a freshman came into the Catholic Center. She told me her name and said, "I'm not Catholic, but I feel like God is calling me to become Catholic." She has a way of becoming Catholic because the Catholic Center is on BU's campus. The Catholic Center is on on BU's campus because people like you donate. So, I'm not asking you to consider donating to "the Catholic Church," but I am asking you to donate to the BU Catholic Center. The Catholic Church is universal, but it is met and lived in particular places and communities. You live your Catholic life in a particular place and with a particular community. 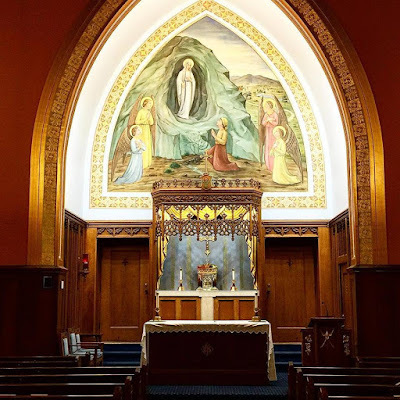 The place and community where I currently encounter Christ and am saved by Him is at the BU Catholic Center. I ask you to support our mission. (This is the letter recently mailed to our donor list). At the end of most summers, I look forward to the return of the students in September. This year, I was dreading it. With so many upsetting stories in the press about the Church, I did not know what to expect when September arrived. Before our first Sunday Mass of the new year, I sat outside of Marsh Chapel on one of the stone benches. Within a few minutes, the first of several students approached with the request, “Hey Father. Do you have time for a quick confession?” The sincerity, purity, and humility of those requests lifted the heavy pall that I had felt for weeks, and it put into my heart a new courage. A courage to strive for more. At moments such as these, it is tempting to withdraw and to expect less. Instead, I ask you to join me in striving for more. More holiness, more Faith, more Hope, more Charity. I want the year ahead for the Catholic Center to be about more evangelization, more friendship, and more generosity. Over the next several weeks, I will be offering the Nuptial Masses of several couples who met and fell in love at the BU Catholic Center. This is what the world and the Church need right now: men and women who are going to re-evangelize the culture by living holy lives, holy marriages, holy vocations. The BU Catholic Community forms men and women to be saints. It probably sounds crazy, but I want this to be our best fundraising year ever. That’s right. In the midst of everything that is going on in the Church, I want this to be the best year we’ve ever had. I know something. I know that the Catholic Center is awesome. I know that the students who come here are amazing. I know that THIS place is what is RIGHT with the Church. I hope that you know that too, and I hope that you will join me in supporting our mission. If you’ve given in the past, would you give more this year? If you haven’t given in a while, could you please contribute today? The Catholic Center at Boston University needs to increase its revenue significantly in order to remain present on campus and to grow. I do not want the Catholic Center to offer less and less each year. No, I want more. I’m asking you for more. I am inviting you to be part of something great. Our annual Phonathon will run from October 27-30, but if you donate now, we won’t call you! Please consider using the enclosed envelope to make a donation to the BU Catholic Center or visit http://bucatholic.com/donate/ to donate to us via PayPal or WeShare. Alumni can also donate through the BU Development Fund. Simply tell them that you want your donation to be directed to Account Number 9300000342. This method of donating also allows for Matching Gifts!